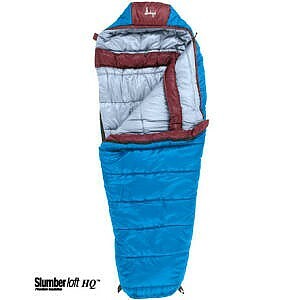 OK winter outer bag, as long as you know how to sleep and survive in cold weather. Too big for a standalone bag for me. I used this bag last winter in northern MN while leading dogsledding/skiing trips as an outer bag combined with an old 15 or 20 degree down inner (probably actually 20-25° now) and spent around 40 nights out in it, in temps ranging from -25°F to 30°F. 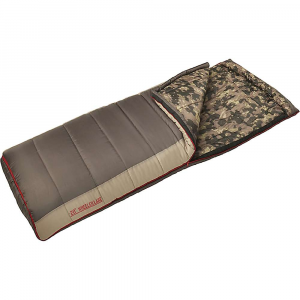 Slept on two Therm-a-Rest RidgeRests under open tarps, in a mid, or in a doglsed. As others have noted, probably not wise to go out in -20° with just this bag, though someone who spends a lot of time outside in negative temps wouldn't die at -20° in this bag either if they employed a few of the strategies listed below. It has a couple drawbacks aside from the overstated temp rating. First, the zipper is tiny and flimsy for a bag of this size. In sub-zero temperatures wearing mittens it isn't as hardy as larger zippers and doesn't respond well to pulling with mittens. I had a guy on a dogsledding trip mess up the zipper of this bag to the extent that we couldn't repair it in the field with what we had, so I gave him my unbroken bag with instructions to zip carefully and then sewed his bag 3/4 of the way shut and used that myself. That night I woke up to pee and the thermometer was hovering in the -15° range. The other obvious drawback is the bulk, which isn't as bad when dogsledding or even pulling a puk, but it's just generally too big for much else. In order to stay warm in any bag below zero, it's important to keep a couple concepts in mind. One, your sleeping bag is a thermos, and if you put a cold body into a sleeping bag it will not warm up in sub-zero temps. We make folks on our trips run sprints, chop wood, do squats, or otherwise get a deep, muscular warmth going before jumping into their bags. We also boil some water, put it in a Nalgene (or two if it gets below -20°), screw the top on as tight as possible, and throw it in the sleeping bag with us. It will stay warm all night. Also, at -20° you should be using an inner bag anyway (a guy in a Mountain Hardwear Lamina -30 and a fleece liner was cold at -20° too) and you'll likely want to use your dry insulating clothing layers as added insulation (down puffy goes around my feet, fleece slides up around my neck to add to draft collar, etc). Another factor in warmth is the amount of airspace your body has to warm inside the bag. This bag is too big for me to adequately warm without an inner bag below about 0 degrees, so I don't use it that way. I fill that space with a down inner, down jacket, fleece layers that I want to keep warm for the morning, etc. When companies measure their EN temp ratings they also assume a decent sleeping pad is being used. Two RidgeRests isn't awful, but I'll add an inflatable atop a RidgeRest this winter for a nicer night's sleep. The bottom line is this bag is bulky and has an inadequate zipper, but is okay as a low-level, heavy winter outer for activities where you don't have to carry it in a backpack if you're careful with the zipper. Yes, the temp rating is overstated, but if you're going out into the woods at -20° armed with just this bag and expecting it to keep you alive, you'll run into trouble. Camping in cold temperatures requires the user to adapt and make the most of their tools. That means you have to work to warm your body through and through before getting in, and be smart about how you use an inner bag or other insulating layers. Welcome to Trailspace, Dan! Thanks for sharing a helpful review of this Slumberjack bag. Do you have any pictures of it you could add to your review for others to check out? I have used it extensively in every type of weather, except very cold ones. The temp rating is way overrated. The last time when I was in an expedition tent set up around 2000 m in the mountain, I took everything off except my underwear and a long sleeve 50% wool military top and the corresponding bottom, then slept inside this bag. The temp got down to -0.5° C. My pad, although 12 mm thick, was not so good, so it was right before the sun up, I started feeling the cold from underneath. It was not that bad, but not under-estimable either. Oddly, my feet never got cold. I kept changing my position until I got up. I do not know, under a better pad and with a little more garment on, how it will perform. I have the long one. I compressed it in an XL size stuff sack. It does compress, but do not expect a miracle. Even inside the stuff sack, it filled so much space in my bag that I could not organize properly; heavy as well. It is not bad for a $70 bag, however, do not count too much on it under freezing temperatures. Thumbs up, but don't say you have used it in every type of weather. 30F is about the limit of this bag, as you have noted. This bag is dangerous. It only has about an inch of top loft. Wearing mid-weight wool long johns, a fleece skull cap, and thick wool socks (everything bone dry), and sleeping on a full length ensolite pad 3/8" thick, I got cold at 40F on a clear dry night in this bag. I am a cold sleeper, but this is a 60 degree rating error and is unforgivable. Someone is going to buy one of these and head out into serious cold believing they are protected and die of hypothermia. Don't be that person. Avoid Slumberjack bags like your life depended upon it. Bag lives up to its name. People who contest otherwise are not dressing appropriately (overdressing) and should find other activities than outdoor ones. This bag keeps you warm. Some writers have indicated that it is overrated. ALL bags are rated for ideal conditions and are thus overrated for some activities. ALL. Bag is comfortable, loft holds up well. NOTE: you cannot overdress and use a bag that is designed for this low of a temperature. The more you wear, the more you will actually sweat. Sweat leads to evaporation, leads to cooling off quicker. This is an overweight 30-degree bag imposing itself as a twenty below bag. I have never before seen such a mis-representation of a product without a company being sued or forced to recall its product. Top has about 1" of loft, as noted by another reviewer (a -20 bag needs to bulge in the middle, not sag). Draft tube is not wide enough and not filled enough (it is a fairly-flat, 2" wide piece). Zipper catches and snags, not on the draft tube, but on the bag itself, ripping and shredding the only thing between you and the out-dated Slumberloft filling. Summary: if you go camping in -20 weather with this bag, you will die. Gone are the days of great Slumberjack, U.S-made bags, with double, zip-down draft tubes and trapezoidal design. I use this product and had no problems. I think -20 is overrated but I have no problems at zero, outside temp was 0 with a 30-35 mph wind all night, on my last trip. I have a nice pad with a rating of R-4. We got 10 inches of snow on top of that. Tent temp (Hight Peaks Col.) was prob 20 Deg. warmer then outside with 2 people. One problem was the zipper. You have to be very careful as it tends to snag on the baffle. Another problem is it takes up 1/2 my backpack, but overall it works well for me. The secret is having a good pad in the winter, and stying dry. I find it hard to believe that you survived 0F in this bag. The Slumberjack Latitude -20°F is not available from the stores we monitor. It was last seen November 8, 2016	at SunnySports.